Alwar has repeatedly been in the national headlines in the past two years for lynchings in the name of the cow. Pehlu Khan was murdered in 2017 and more recently, Rakbar Khan died in custody; both men were accused of cattle smuggling. Alarmed, the Supreme Court has repeatedly asked state governments to rein in cow vigilantism. "Cow blood has been shed on this land, on my land. 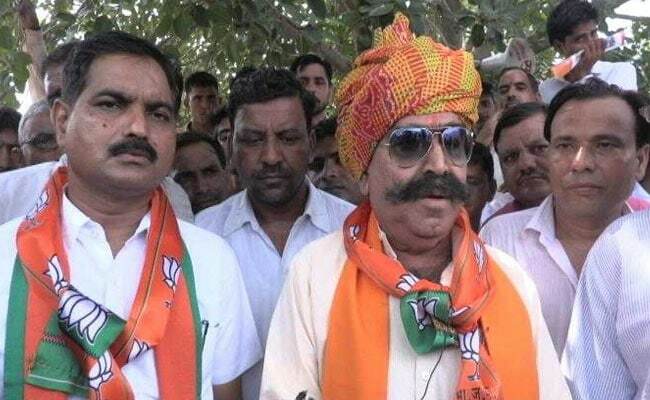 Russian and American scientists, after studying Hindu shastras, have confirmed that whenever and wherever cow blood is spilt, there will be earthquakes, tsunamis and volcanoes will erupt" - Gyan Dev Ahuja, a BJP lawmaker in Rajasthan's Alwar, delivers the little speech without flinching as he campaigns for elections in the state due later this year. Yet NDTV has come across BJP lawmakers who are using incendiary rhetoric in the name of the cow while campaigning in the state. Gyan Dev Ahuja says, "We don't have any problems with Parsis, why do we have problems with Muslims?" "We don't have any problems with Parsis, why do we have problems with Muslims? If they blend like sugar into water there will be no trouble. If they stop cutting up the cow, there will be no problem," said Gyan Dev Ahuja, with a theatrical twirl of his handle-bar moustache. A large section of Mr Ahuja's election machinery comprises members of gaurakshak (cow vigilante) groups, like Dharmendra Singh from the Vishwa Hindu Parishad (VHP), an outfit affiliated to the ruling BJP's ideological mentor Rashtriya Swayamsevak Sangh (RSS). "When the government is lax we have to take to the streets to protect the cow, the country and the Hindu religion and make sure Hindus come together to vote in the right manner," Mr Singh told NDTV. Another Ahuja supporter is Sanjay Bakshi, the owner and principal of Ramgarh's most popular English medium school and the head of a cow protection group. "There are parts of Ramgarh which we call mini-Pakistan. They (Muslims) take our girls, they slaughter cows. I am telling you clearly that such incidents are increasing and there can be a big danga (riot) in Ramgarh anytime", he told us. Mr Ahuja's protege Banwari Lal Singhal is the BJP lawmaker representing Alwar city. Also a staunch VHP member, Mr Singhal's latest campaign focuses around his claim that Rakbar Khan did not die in police custody but committed suicide, despite overwhelming evidence to the contrary. "The gaurakshaks sent him (Rakbar) peacefully to the police station, even the police did nothing. I think he knew he was guilty so he himself consumed poison," Mr Singhal said. Mr Singhal cursorily lists some development projects he has commissioned before launching into details of his campaigns against Muslims. "The Muslims have made cow their vyavasaya (business)...They will not stop cutting up our mother and eating her. Gaurakshak groups help the police, they are doing social service," he said. In the last assembly election in 2013, the BJP won nine of Alwar's 11 assembly seats. In the 2014 national election, the party won the Alwar Lok Sabha seat. But in a by-election this year, the Congress did well, winning back the Lok Sabha seat. Analysts say Hindu-Muslim polarisation is one way that BJP leaders may see as a way of regaining lost ground. Alwar falls in the Mewat region, which has a high percentage of Muslims, known as Mev Muslims. Far more pressing issues like water scarcity ought to take centrestage. Ramgarh, Mr Ahuja's seat, is an extension of an arid region which spills over from Haryana into parts of Rajasthan. But water scarcity or crop procurement prices - another important issue - barely get a mention. The climate of hate "leaves us feeling very vulnerable and scared, especially as elections near," says Farman Ali, a Mev Muslim and the owner and director of one of Alwar's most popular coaching institutes located in the heart of the city. "Outside every home here you will see cows. We Mevs depend on cattle, depend on dairy but now people are so scared they will not even take a sick cow to the doctor because of the fear of getting lynched," he said. Mr Ahuja is unfazed. "If gauraksha is our dharm, (religion) it is also our politics. I am not defending the alleged killers of Pehlu Khan, I do not support violence but I ask you if Khan was not guilty, why did he run away. Gaurakshaks are only abiding by their dharma."